Can you have it all? Can you be a full-time mother and still have a lucrative, rewarding career? Should contract work appeal to you, finding jobs won’t be a huge problem. The world is changing. Thanks to this, a lot of employers are offering part-time, short-term and even long-term jobs via the Internet. These are perfect for at-home workers. Once you get started finding jobs, you’ll probably need to put a few other things into place. Questions about home offices, benefits and other technicalities are likely to arise. 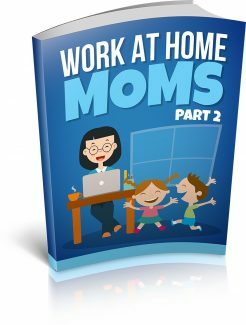 As you explore your opportunities, prepare your home office and set up a life that doesn’t involve being away from your child, this e-book is your guide. IS WORKING AT HOME YOUR CUP OF TEA? As you look into your child’s eyes, chances are the thought of donning a suit and returning to the office is a little staggering. Staying at home and working at home can prove to be an incredible experience for you and your little one. It can, however, also be a nightmare in the making. It all depends on how well you and your family can handle the transition. Some women and their families thrive better when work stays at work. Others shine in the home business setting. No matter what path you choose, as long as it works for you, it is perfect! So, how can you go about determining if working at home really is your cup of tea? First off, you’ll want to examine your financial situation. To successfully launch a career from a home office, it can help to have a little bit of breathing room financially. Keep in mind; however, by staying at home, you will also save yourself a little bit of money. Beyond the dollar issues, there are questions you will need to ask of yourself and also your spouse and family members. To make a real go of a home business or moving your full-time career into your home, you are going to need to have the right personality to pull it off. Plus, you will likely need some serious support from family, as well. Let’s take a look at a few of the things you’ll want to consider to help you decide if working at home is for you. Working at home can prove to be very lucrative for many mothers. It might, however, require a little time to get a steady cash flow going. With this in mind, there are a number of things you’ll want to examine before deciding to dive in with both feet. Should you discover the timing isn’t quite right, don’t worry too much. You can still work on a home-based business on weekends or at night and try to build it up quickly so you can stay at home full-time in no time at all. - Your Monthly Budget Take a good hard look at your monthly bills and just how much of a contribution you make. Do remove things from the budget that won’t be in place any more, such as childcare and commuting expenses. Now, keep in mind it can take a little time to build up a business enough to cover bills and other expenses. If your contribution is imperative for your family’s bottom line, check your savings. Do you have enough to cover your contribution for at least three months? Six or 12 would be even better. Is this base covered? If it’s not, consider transitioning into full-time, at-home work as you build up a nest egg to cover yourself. Getting on a slow and steady path in the right direction beats not getting on the path at all! With a little time and dedication, you can make the dream happen. - Your Anticipated Additional Expenses Starting a business at home can cost you in upfront capital. In addition to making certain your family is covered financially during the transition, you will need cash for setting up an office, buying equipment, advertising, getting licensing and perhaps insurance and so on. It is possible to obtain a small business loan for these things and also to help cover you during the startup months. Keep in mind, however, that this will start your business out in the red. Sometimes it’s just better to save up and open the books in the black. - The “Red Zone” Estimation Although you won’t be able to plan out exactly when your business will start making money to the day, you can put together a fairly sound estimate. Be realistic here and do anticipate at least a three-month period for a good build up. This will help you determine how much padding you need in your bank account to remain comfortable as you build your business. The financial side of things can be a very big consideration when you choose to stop working in an office and transition into your own business. Do make sure you have your bases covered. Some of the options that can help you include loans, grants, savings or even just starting out as part-time with the business in order to build it up. Money, however, isn’t your only concern to deal with.